Powers/Abilities: Drothor was a sorcerer with knowledge of the occult arts. History: (Tales to Astonish I#11 - (fb) ) - In ancient days, a man named Drothor, shunned by everyone because of his ugliness, turned to the practice of the black and mystic arts. He commanded the forces of the darkworld to punish those who dared scorn him because of his appearance. (Tales to Astonish I#11 - (fb) ) - An artist, intrigued by Drothor's unusual features, begged him to paint his likeness, but thinking the artist only wanted to paint him so others could laugh at him, Drothor invoked the denizens of the netherworld to punish the artist. The artist was plagued by nightmares of Drothor until a fatal accident befell him -- a stone statue toppled on him while the portrait of Drothor faded from the canvas. 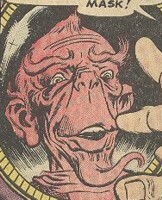 (Tales to Astonish I#11 - (fb) - BTS) - Drothor's curse struck all who made reference to his face. (Tales to Astonish I#11 - BTS) - In modern times, Markas the mask-maker lived a life of poverty, misery, and despair -- his work was once known the world over, but now he was reduced to making his creations for Halloween and masquerade parties. Needing inspiration, Markas consulted an arcane tome, "The Strange Legend of the Face of Drothor". Piecing together an exact likeness of Drothor from the text (as the ancient book had no illustrations), Markas molded Drothor's face and completed a mask. Putting the mask on and inspecting it in the mirror, Markas was amazed at how lifelike it looked. He scoffed the curse of Drothor as pure nonsense. Markas decided to wear the mask to commit a robbery. While wearing the mask as a disguise, he broke into the home of a wealthy former client. Markas robbed the wall safe, but accidentally set off a burglar alarm. As he was pursued by police, Markas thought he was safe because his true features were hidden by the mask. When he returned to his home, he hid the money, and while laughing at the curse, he removed the mask just as the police entered. But the police knew they had found their man because Markas' real face had been changed into the likeness of Drothor! This story -- "I Wore...The Mask of Drothor!" 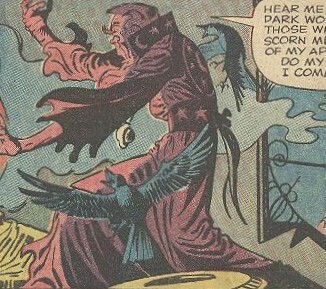 -- was reprinted in Chamber of Darkness#7 (October, 1970). It was never made clear exactly what time period Drothor was supposed to have lived in, only that is was "in ancient days". Although his presence was never actually seen in the story, I guess Drothor could still be around. Maybe he's currently dwelling in some timeless nether-realm. Maybe he'd make a good foe for Dr. Strange. Since he was known to consort with denizens of the darkworld, I suppose maybe it could be Nightmare who was behind that artist's nightmares, and maybe it was the Demon of the Mask who worked his mischief on Markas. According to comics.org the Drothor plot was a retelling of a story in Tales Of Suspense I#6 (November, 1959) "Who Hides Beneath My Mask?" and was then retold again in Strange Tales I#91 (December, 1961) "The Mask Of Morgumm!" A mask-maker who used an ancient book for inspiration, he unknowingly unleashed the curse of Drothor upon himself when he made an exact duplicate of Drothor's ugly face.